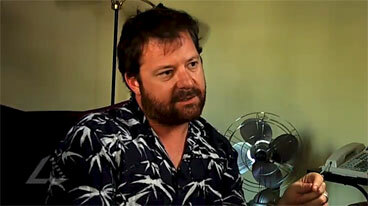 Video clip synopsis – Alister Grierson, director of the 2006 feature film "Kokoda" talks about historical accuracy and representing war experience on film. Broadband MP4 kokwarfil_bb.mp4 (16.3MB), suitable for iPods and computer downloads. This clip comes from a 2007 forum on the topic of “Australian history in the classroom”. Alistair Grierson, director of the film Kokoda was interviewed as part of the students’ Learning Journey in preparation for the Forum. Locate the Kokoda Track on a map. Try drawing a cross-section of the Track using information on the map. Estimate the difference in height between the lowest and highest points of the Track. Imagine having to climb and descend that distance carrying a weapon, rations and water while having to fight a better-equipped and trained enemy through jungle, mud, torrential rain every night and day. Discuss your imaginings with others in your class. Visit the Australian War Memorial website and use the online collection search engine to gather information on the Kokoda Track. Imagine that fighting were to take place on the Kokoda Track in 2008. How would the battle be different to the 1942 conflict? What advantages would modern weapons technology give to the soldiers on either side? Discuss these notions with your entire class. Discuss in small groups what may have happened if the Japanese advance along the Kokoda Track hadn’t been stopped. What may have been the result if the Japanese had reached their objective of Port Moresby? Put the sheet up where all of the class can see it. Examine each challenge in isolation; discuss it and come up with ways that would overcome that challenge. Write those suggestions down near the challenge in a ‘mind-map’ style. Examine all of the challenges in this way. c) Once the class has examined all challenges, divide the class into small groups. Each group will select one and its possible solutions and develop a presentation that shows in a visual and written way how the solutions would work. An outline of the story, including major characters and the ‘hook’ in the story that will keep audiences interested. Remember that your story needs some sort of main theme e.g. a relationship, the futility of war, heroism, the ‘journey’ of a character and so on. The story may be presented in a ‘storyboard’ format commonly used in the film industry. A title for the film – something that will inspire people to see it but not give too much of the story away. Some internet research may be required; the Internet Movie Database is a good resource, as is the National Film and Sound Archive. More information is also available at Making the Movie. Have three people in your class take on the role of film studio executives. Select a group of directors from the class and have each of them ‘pitch’ their film idea to the studio executives. Each director will get no more than 2 minutes to present to the executives. After all of the directors have presented, give the executives 5 minutes to discuss in private the presentations and select a successful ‘pitch’. While the executives are deciding, the class can discuss the ‘pitches’ and perhaps choose a candidate. Bring the executives back in and have them announce their decision. Have them provide reasons for their choice. If they choose someone different to the class choice, discuss the executives’ choice and find out what made that ‘pitch’ more successful.